The Guards are proven in combat as light and mechanised infantry and train across the world. "I chose to be a guardsman because I wanted to go on operations. I deploy to Afghanistan next year." They might be famous for standing guard outside Buckingham Palace in their red tunics, but British Army guardsmen are also fully trained combat soldiers who deploy on operations abroad. Join them and you'll take part in everything from peacekeeping and disaster relief to armed conflict. You'll also take part in some of Britain's most high-profile public events, like Trooping the Colour. 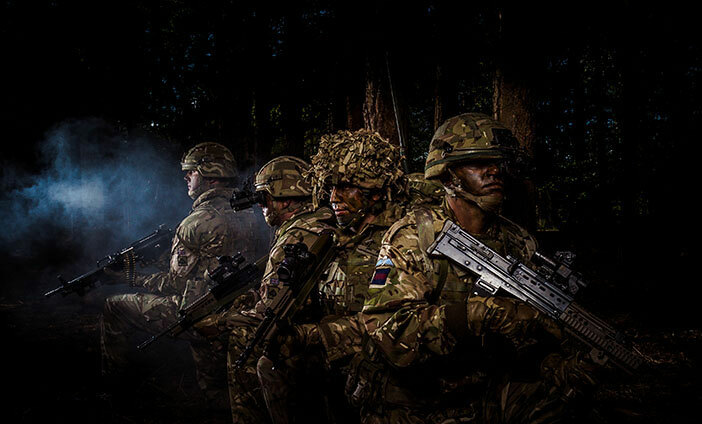 Become a highly trained frontline infantry soldier. Specialise in reconnaissance as part of your infantry duties. Operate mortars, machine guns and anti-tank missile systems. Train as a junior non-commissioned officer and lead Guardsmen. Serve with the Guards Parachute Platoon as part of 16 Air Assault Brigade. You will be called forward for the 30 week Combat Infantry Course at Catterick. Guards Company instructors will coach you through progressive training in physical fitness, firing weapons, navigation, tactics, survival and driving. If you are 16-17 years and 5 months old, you start at the Army Foundation College Harrogate first, then train at Catterick. On completion of your initial training in the Guards Company at Catterick, you will move to your Guards battalion. Guards battalions conduct training in UK and in Kenya, Canada and Belize routinely. More concentrated periods of mission specific training prepare Guards battalions for operations abroad. "As a Guardsman, I have become motivated, proactive, confident and committed member of a close-knit team. I am deploying on operations abroad and then I want to be selected as a Lance Corporal. I have also taken part in Trooping the Colour for HM The Queen which was the proudest day of my life."